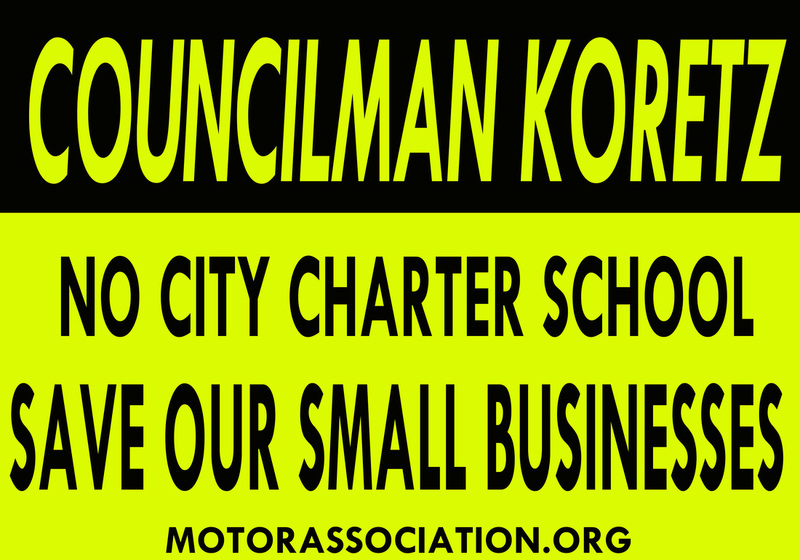 We are pleased to announce that we have been successful in our campaign to stop City Charter School from locating at the corner of Motor Ave and National Blvd. As we have said before we have no problem with the school itself, but instead the negative impacts that the school location would bring to the businesses, traffic, and revitalization of the community. The needs of the community are always our highest priority. 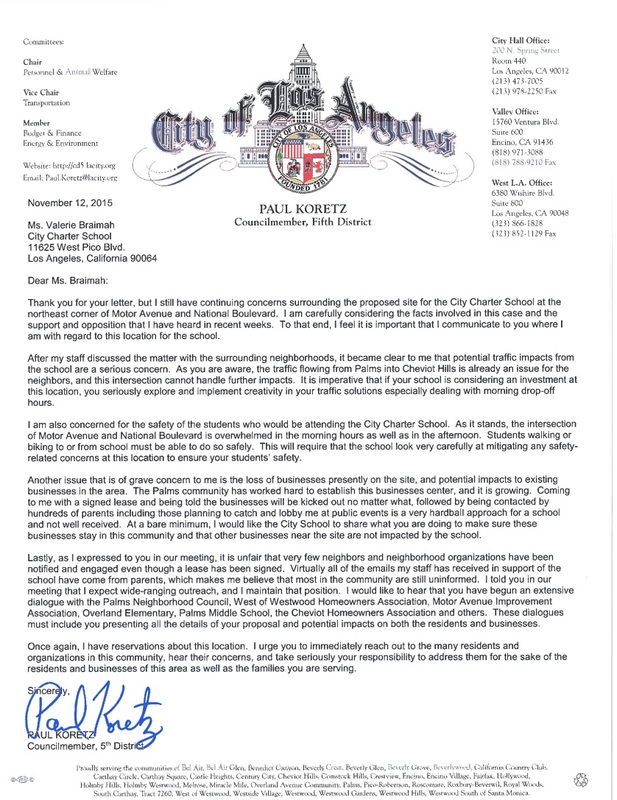 After extensive community outreach and correspondence with Department of Transportation (LADOT) and the Council Office, it was clear that the negative traffic impacts during peak hours that the school would bring, could not be mitigated in any way. After hours of research on the traffic study and numerous conversations with LADOT, it was explicitly clear that the configuration of the available driveways and street access points, the bike path and other issues do not provide for the passenger loading needs that a school will require. In addition the increased traffic counts would violate the Century City Traffic Management Plan (CCTMP). They failed to take into account the freeway onramps, future METRO station traffic, and a congested carpool lane next to an existing carpool lane. We were able to bring these and many other issues to the decision makers at the Council Office, LADOT, and other agencies to shed light and add transparency so a real educated decision could be made. ﻿The Motor Avenue community has been informed about changes to the neighborhood that will negatively affect the community of Palms business, commute, and daily routine. After extensive outreach to both residents and businesses in the community, we would like to express our position on the addition of City Charter School at the property located at 3280 Motor Avenue at National Boulevard. While we value the efforts of City Charter School to improve the educational experience for its students, we DO NOT believe that a school is a suitable option for this location at 3280 Motor. We have requested that the Councilman partner with our community in stopping City Charter School from locating at the Motor Avenue and National Boulevard intersection. They promise parking and lots of new business for the community. This has not and will not occur. The kids are dropped off and picked up with bring nothing but the gift of more traffic. Most of the children are not from our community. They have told the local community that our councilman is in support but this is not factual. Councilman Paul Koretz has stated publicly that he is NOT supportive and this community is not supportive of a school at this location. ​Already hundreds of immediate areas residents and businesses have signed hard copy and electronic petitions to the office of Councilman Koretz. As members of the community, we do not approve of the relocation of City Charter School, a privately owned institution for middle and high school students, to a facility at the intersection of Motor Avenue and National Boulevard (3280 Motor Ave.). City Charter School will cause several issues for business owners and residents alike. While schools can be an advantageous appendage to a community, the current makeup of this location in question is not conducive to a school environment. Motor Ave and National Blvd are both transitioning from single-use residential buildings to mixed use buildings with housing and commercial businesses and creating an energetic mixed use and active business environment. The growth of commercial business is part of our design guidelines and the future of the Motor Avenue Palms intersection as a vibrant business hub. In an effort to promote smart growth and walk-ability in this community, The Motor Avenue Improvement Association (MAIA) supports the implementation of commercial businesses that generate activity throughout the day, evenings and weekends. Street-level businesses will provide a vibrancy and livelihood that the Motor Ave community needs and that a school will not provide. The relocation plans by City Charter School to this intersection have already negatively altered the composition of businesses in the area. Businesses have been displaced from the building located at 3280 Motor Ave. This has disabled businesses such as C&M Café and Printex from expanding or renewing their lease. In addition it is dislocating businesses that have been part of Motor and Palms for over 15-20 years including a church that has also been a vital part of our religious community. Business owners in this proximity have been informed by City Charter School that they plan to overtake the entire center, resulting in a serious reduction of commercial activity. This plan is unacceptable to our community members as many of these businesses have been the bedrock of our community for years. It will undoubtedly harm this community and hinder the extensive revitalization efforts that have taken place thus far. City Planning and Department of Transportation of the City of Los Angeles has chosen Motor Avenue as two out of seven streets throughout the city to implement Parklets and one of five streets to implement new design guidelines and a streetscape plan. This effort is being undertaken to stimulate the business and residential community. The street and this intersection in particular will be experiencing new intersection lighting, trees, street furniture, and many other enhancements. This school will be closed evenings and weekends negating these efforts and destroying the vibrancy of our core business intersection. Even with parking at a premium the school will not be able to mitigate any of these damages by providing parking to the community and as a Westside commuter school where kids are dropped off and picked up, there will be no economic benefit. In addition to the major traffic concerns and the threat to local businesses, the location is currently zoned as M1-1 Limited Manufacturing. A school should not be permitted to be installed on land with an M1-1 zoning designation, which should be reserved for commercial entities that generate commerce for the Motor community. This location is also not a suitable option for a school due to the adjacent freeway. The close proximity of this location to the freeway is unhealthy for children. Several studies have shown that schools in proximity to freeways have higher rates of respiratory diseases and disabilities. This poses a risk for children who would be consistently exposed to air pollutants on a daily basis. The state of California has passed laws prohibiting schools from locating within 100 feet of freeways. An alternative option must be sought out. Additionally, there is also an auto body shop on the same block as the intended location for the City Charter School. The emission of fumes from painting and welding as well as silica from sandblasting is hazardous to children walking past that on a daily basis. The LA City Planning Commission has expressed specific concerns and stated that where projects require discretionary approval, and are within 1,000 feet of freeways, the City has an opportunity to impose conditions to lessen the effects of air pollution exposure. The City Planning Commission advises that applicants of projects located in proximity of a freeway, and contemplating residential units, schools, and other sensitive uses, perform a Health Risk Assessment as a supplemental technical report. Review of recent air pollution studies shows a strong link between the chronic exposure of populations to vehicle exhaust and particulate matter from roads and freeways and elevated risk of adverse health impacts, particularly in sensitive populations such as young children and older adults. There is a bar and a liquor store directly adjacent from the intended location of the City Charter School and a third within 500 feet. A school will have a detrimental effect on future permitting on both of these establishments that have been on Motor for two generations. Our city and school district would be opposed to a liquor store or bar opening up directly across from a school, the same opposition should stand for a school opening across from a bar and liquor store. The addition of a school establishment at the 3280 Motor Ave address would introduce increased traffic issues to an intersection that is already plagued by traffic congestion during peak hours. Nearby residents and commuters will be completely stuck by a lengthened morning and afternoon trip to their homes and workplaces. The local businesses will suffer even more than they do currently as they attempt to get patrons into their establishments. In addition, the existing configuration of the available driveways and street access points do not provide for the passenger loading needs that a school will require. A comprehensive reconfiguration of this center for the sake of the school would conflict with current plans for this intersection and the resulting costs to the community would be both numerous and unwarranted. During drop off and pick up times, school traffic will prevent residents and patrons from accessing the nearby businesses. Such a disadvantage should not be imposed upon the businesses as they are a critical component of this community and a fundamental part of economic growth in this area. This situation will just get worse as Fox, Century City, Westfield and other large entities expand. City Charters own "Fact Sheet" says they will expand to over 840 students but only allow for 117 cars. This is not realistic and will never be reality. They fail to also mention this is twice a day and what about all the faculty and staff? We are talking many hundreds of additional cars a day. Lastly, there is no need for another school in this area. There are three schools in just a two block radius, Palms Elementary School, Vista School, and Le Lycee Francais de Los Angeles, that have a collective total of over 2000 students. The inclusion of another school would not only be totally unnecessary in this community, but it would prevent the entrance of other entities or organizations that would be more beneficial to the residents and business owners. Furthermore, there are three additional schools within a mile radius of the intended location of the City Charter School—Notre Dame Academy Los Angeles, Notre Dame Academy Elementary, and Palms Middle School. This only further saturates this area with schools. ​Besides the intrusion that a school at this location will cause to the vibrancy of Motor Avenue businesses, it would not be primarily serving the students of Palms. In their proposal, City Charter School has stated seven different zip codes that they would like to focus on from which they would draw students. The majority of the stated zip codes—90034, 90019, 90035, 90005, 90057, 90016, 90018—are all east of the 3280 Motor Avenue address. If the majority of focus areas are further east of Palms—as far as MacArthur Park and West Lake—we’d suggest that the school be located further east from Palms. Los Angeles High School was permanently offered to City Charter School and is where they are currently located. 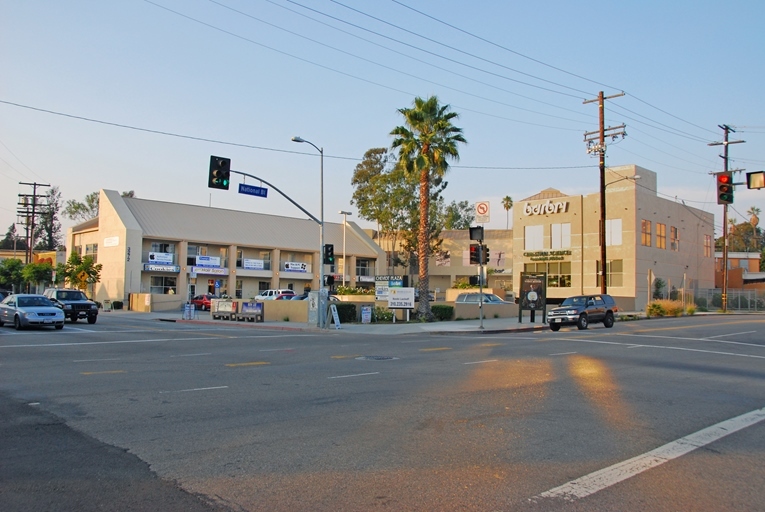 They also had an opportunity to lease a building on Venice Blvd. which and the council office supported but they chose to not take that location. Los Angeles High School would be a better location for the focus areas that City Charter School has stated in their proposal as it is very central to all zip codes in the focus area (See map below). The majority of people fighting for this location are Westside parents who do not fall within the catchment area that City Charter designated. These parents simply do not want to drive to the Los Angeles High School campus area. The needs of the community are our highest priority. We hope that we have your commitment of nonsupport for the chosen location of City Charter School as it would have a number of severe negative environmental and economic impacts on our community. 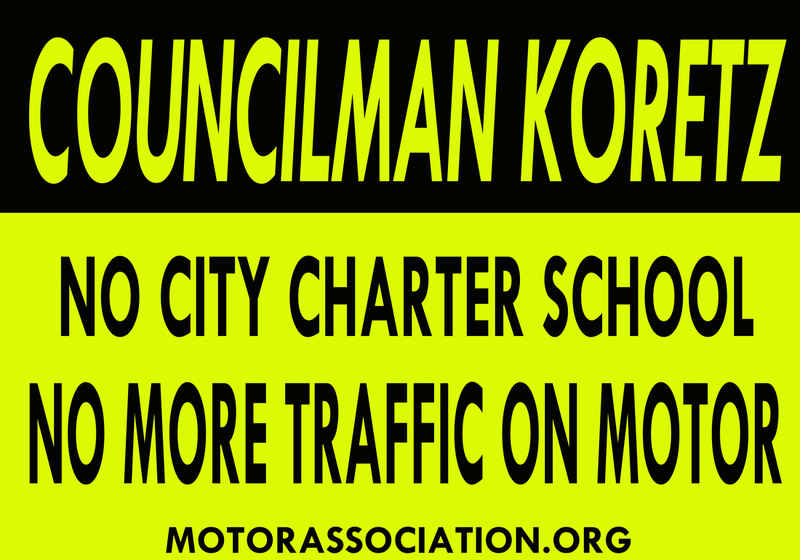 In light of these issues,WE DO NOT support City Charter School’s relocation and do not see the benefits of another school in our already school congested Motor Avenue community. Many parents from the school are passionate and emotional while supporting their school. We agree that it is a wonderful school for the kids who are in attendance. That is not at issue. The issues at hand are that this is not an appropriate location for a school. 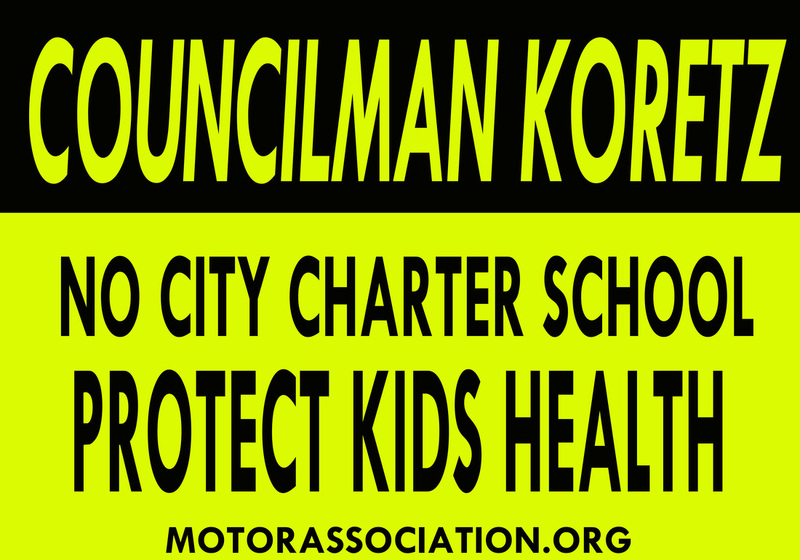 Over two hundred emails and petitions have been sent to Councilman Koretz and his staff, the School Board Member, West Side NC, Cheviot Hills leadership, the Palms Neighborhood Council and others. Senate Bill (SB) 352 ‎School Sites Sources of Pollution in 1903 prohibits schools from being within 500 feet of a freeway. Our very own Councilman Koretz voted for SB-352 when he represented the 42nd district in the State Assembly. They state that by 2018 the school will serve 840 students in addition to their staff numbers, and yet they feel that they can maintain car count under 117. There is no way they can reasonably expect to have 117 cars visiting the school on a daily basis (staff and students combined). They believe that they will be able to enforce carpool requirements and get students to the school using other means of transportation. What’s stopping these families from dropping their kids off a few blocks down the road? This would still mean a major increase in traffic flow. There is no way that they can actually expect to enforce some of these requirements. A recent visit to the current site has shown parents double parking to drop off one child. If they cannot enforce the rules now how will they be able to in our community? They say that they have been working with the community to answer questions since the project was first proposed. We know this is completely false and actually the opposite of what is going on. They have had a traffic report for 4 weeks and it still has not been released for the Palms community to review. Per their own fact sheet, they have stated that 36% of City School students live in surrounding communities. Schools such as Overland, Emerson, and Westwood Charter Schools are not in the catchment area of the original petition for their charter. None of these communities are a part of Palms. We have gone door to door and spoken to every business within two blocks of their current location. Three mentioned that they had done minor business with the school or parents. The overwhelming majority have received no business what so ever from the school or its parents. Thoughts from the Palms community meeting. While the statements sound good, they just do not hold water. They said they will have carpool come in the North entrance that will be built off National. North on National is a no go for carpool! We already have a BIG car pool line right there for the French School. This will affect the French School significantly and they have not had one conversation with the French School administration regarding this issue. It will also conflict with the City and Metro plan for the bike path that is on the books. Charter school does not consider that at all and once again has not done their homework. They said the local businesses support them. ‎We have signatures from almost every business within two blocks. Untrue. They said the businesses on site support them. Ya got to be kiddin us!!!! ‎Untrue They said the owner was evicting the local businesses on site anyway. Untrue. They said the local bar supports them. Untrue. ​They said the kids will play at Vista Del Mar or walk to the park as no buses will be used. Vista has written a letter to Councilman Koretz saying that they do not plan to provide any space and have never spoken to the School. They said the kids will walk to Rancho Park, we don't think so as it is an hour walking back and forth. Or, they said, the kids would play at Woodbine park. LOL. It is tiny pocket park with no green space to run. They clearly have never been there!